Delkin Devices, Inc. today expanded their lineup of CompactFlash card storage by announcing four new blazing fast 420X PRO cards capable of transfer speeds up to 63MB/s. 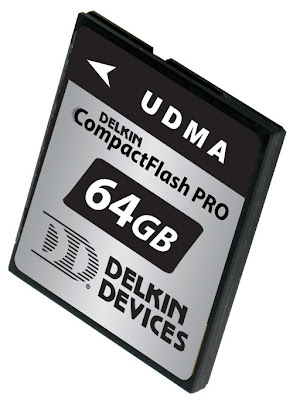 The new UDMA enabled flash memory is available in capacities of 8GB, 16GB, 32GB and 64GB. With just a couple of those in your pocket, you should be able to shoot your entire vacation. I'd love to get my hands on a couple prior to my trip to El Salvador.